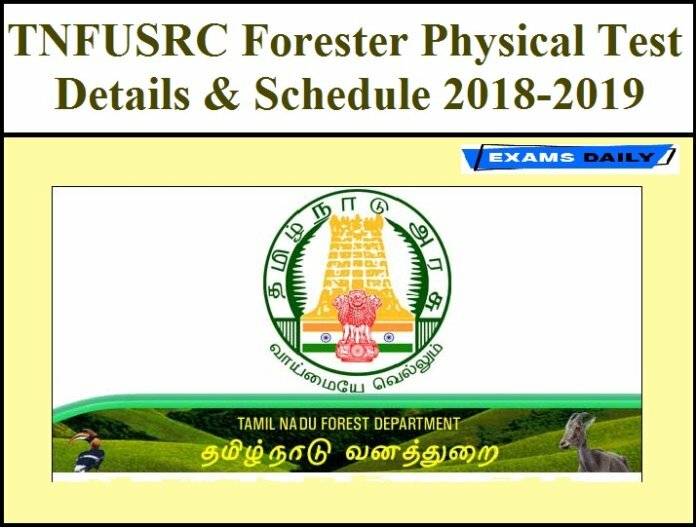 Tamil Nadu Forest Uniformed Services Recruitment Committee (TNFUSRC) has released Batchwise list for Certificate Verification / Physical Standards Verification / Personality Test for the post of Forester. The Certificate Verification / Physical Standards Verification/Personality Test for the post of Forester is scheduled from 18.02.2019 to 22.02.2019 at Joint Forest Management Centre, Velachery, near Velachery check post, Chennai-600 032 in four batches as per the following table. Due to Administrative reasons, the Post Examination procedure scheduled on 18.02.2019 and 19.02.2019 is re-scheduled to 24.02.2019 and 25.02.2019 respectively. All other details remain unchanged and the Post Examination procedure for 20.02.2019 to 22.02.2019 onwards remains unchanged.